The Collection includes an impressive body of work by the extraordinary Robert Knight (1920-1987) and the influential Malcolm Poynter (1946-), as well as fascinating early works by the artist partners, Tim Noble (1966-) and Sue Webster (1967-). The Collection is particularly notable for it`s remarkable range of drawings, including a fine pen and ink by the Austrian, Gottfried Helnwein (1948-). Aside from Superhumanism and works related to it, the Collection includes Pop Art by Jann Haworth (1943-) and Nick Monro (1936-) and from the very early days of the Treadwell Gallery(1962-64) works by the Indian Progressives, Francis Souza (1924-2002) and Sadanand Bakre (1920-2007), as well as Guyanan abstract expressionist, Aubrey Williams (1926-1990), Canadian Watercolour specialist, William Newcombe (1907-1969) and the figurative painters, Pole, Marek Zulawski (1908-1985) and the Australian, Tony Underhill (1923-1977). 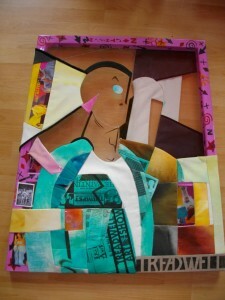 Treadwell by Jann Haworth, 2008, 82x90cms, Sewn canvas and Mixed Media...Gifted by the Artist to the collection 2010. The excellent photos of the Collection have been taken by Armin Plankensteiner of Artware, Vienna. Thank you Raimund and Armin.